Looks like Disney Junior is keeping Fancy Nancy around. Today, the network announced they’ve renewed the TV show for a second season ahead of its debut. Fancy Nancy premieres on Disney Junior on July 13th. Based on the New York Times bestselling book series, Disney Junior’s animated family comedy “Fancy Nancy” follows six-year-old Nancy Clancy, a high-spirited young girl whose imagination and enthusiasm for all that is exquisite transforms the ordinary into the extraordinary – from her vast vocabulary to her creative and elaborate attire. Geared towards kids ages 2-7, each episode features two 11-minute humorous and heartfelt stories that showcase themes of self-expression, originality and love of family. Young viewers are introduced to the problem-solving power of imagination through the relatable, imperfect Nancy and the comical situations she gets herself into. A creator and true optimist, Nancy is unapologetically herself and holds a steadfast vision of what she expects in the world. Her unwavering belief that she can accomplish her grand ideas encourages those around her to pursue all types of adventures. With help from her sensible best friend Bree, Nancy uses ingenuity and resourcefulness to exemplify that even if life doesn’t always go as planned, it’s important to make the most of each day and encourage others to do the same. Nancy demonstrates a love of language and invites young viewers to expand their vocabulary by learning French, or, in her mind, “fancy ways,” to say everyday words. Music also plays an important role in the series, with almost every episode featuring new original songs showcasing a variety of musical styles ranging from pop and jazz to big band, classical and swing. The theme song, “Add a Little Fancy,” is written and produced by Matthew Tishler (“Austin and Ally,” “Teen Beach 2”) and the original underscore is composed by TJ Hill (“Planes: Fire and Rescue”). 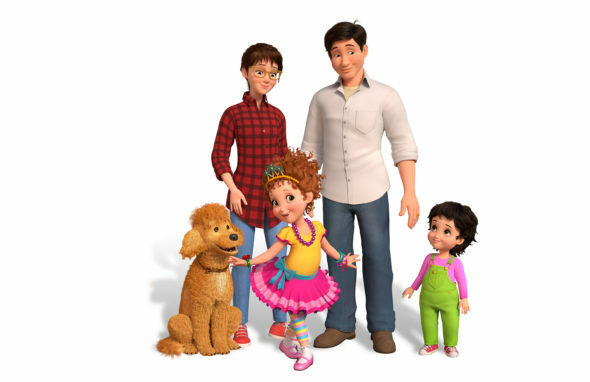 Nancy’s family consists of her parents, Claire and Doug Clancy, a united team whose parenting style focuses on empowering their children to think for themselves and draw their own conclusions; three-year-old sister JoJo, who is always eager to take part in whatever Nancy is doing; and Frenchy, the family’s pet dog who adores Nancy. In addition to her tight-knit family, Nancy’s neighbor, Mrs. Devine, serves as a mentor to Nancy in all things fancy. The “Fancy Nancy” voice cast includes Mia Sinclair Jenness (“Matilda”) as Nancy Clancy; Alyson Hannigan (“How I Met Your Mother”) as Claire Clancy; Rob Riggle (ABC’s “Modern Family”) as Doug Clancy; Christine Baranski (“The Good Fight”) as Mrs. Devine; George Wendt (“Cheers”) as Grandpa Clancy; Dana Heath as Nancy’s best friend Bree; Tatyana Ali (“The Fresh Prince of Bel-Air”) as Bree’s mom; Kal Penn (ABC’s “Designated Survivor”) as Mr. Singh; Ian Chen (ABC’s “Fresh Off the Boat”) as Nancy’s cousin Jonathan; Chi McBride (“Hawaii Five-0”) as mailman Gus; Spencer Moss as Nancy’s younger sister JoJo; Malachi Barton (Disney Channel’s “Stuck in the Middle”) as Nancy’s friend Lionel; and Madison Pettis (Freeform’s “The Fosters”) as Brigitte. The series is executive produced and directed by Jamie Mitchell (Disney Junior’s “Sofia the First”) and developed and story edited by Krista Tucker (Disney Junior’s “Sheriff Callie’s Wild West”). Matthew Tishler serves as songwriter and music producer, and TJ Hill is composer. The series is produced by Disney Television Animation and carries a TV-Y parental guideline. What do you think? Do your kids watch Disney Junior? Will you watch Fancy Nancy? More about: Disney Junior TV shows: canceled or renewed?, Fancy Nancy, Fancy Nancy: canceled or renewed?